If your practice is missing calls, you’re losing out on important opportunities. People don’t make physical phone calls in this millennium unless something is seriously wrong, complicated, or time-sensitive, and missing such literal calls for help both delays patients who need care and prevents your practice from growing and remaining financially viable. Of course, nobody intends to miss calls; it only happens because medical offices are hectic during the workday and then prohibitively expensive to staff at night or on weekends. So is the problem intractable? Are medical practices forever destined to miss calls? No, I mean, I’m writing a blog article about it, so you know that I have some answer in mind, and the good news is that phones have advanced tremendously since the days of copper landlines and tape-powered answering machines. If your current medical phone system doesn’t have features for call rescue, smart routing, texting, and other essentials, then it’s failing you and your patients. Let’s get up to speed. Sometimes people will call your practice and not reach a human. This is unavoidable unless you staff your phone lines 24/7 (painful and inconvenient), pay for a nurse triage line (expensive), or hire an answering service (live humans but otherwise pretty similar in function to voicemail). 74% of people are likely or very likely to choose another business after a negative phone experience. Of these possibilities, #3 is clearly the worst. If a prospective new patient calls you but then gives up, you’re probably not going to hear from them again. One industry study, for instance, found that 74% of people are likely or very likely to choose another business after a negative phone experience, with the authors also reporting that healthcare is one of the top three industries that people want to contact by phone.1 These figures together suggest the dangerous possibility that would-be patients are likely both to call your clinic and to be very dissuaded if that call goes poorly. People are also unlikely to call back if a first call doesn’t go well. One telecom firm has reported that “customers will only try to call a company twice […] before taking their business elsewhere,” while “a fifth will only call once.”2 The company doesn’t provide the methodology behind those numbers, and they sell products that benefit from them, but the sentiment passes the gut test; not many of us will continue to call an organization that doesn’t respond. Trying to reach a potential customer within an hour of their query makes you 60 times as likely to have a meaningful conversation with them as trying after 24 hours. Most of us won’t bother to leave voicemail, either. I looked hard for good data on how many people hang up instead of leaving voicemail, but concrete figures don’t seem to exist. Most relevant articles cite a Forbes piece, which puts the no-voicemail rate at 80%, but it doesn’t include a citation and the work itself actually seems to be a thinly veiled advertisement.3 In any case, I think the directional point is correct that a large number of people simply won’t leave voicemail; they’ll just hang up, and you’ll lose your chance with them. Finally, even if a prospective patient does leave you voicemail, or you reach out to every number that doesn’t leave a message, you may find that you’ve missed your window by the time you call back. Research from the Harvard Business Review found that, in some contexts, businesses “that tried to contact potential customers within an hour of receiving a query were nearly seven times as likely [to have a meaningful conversation with a key decision maker] as those that tried to contact the customer even an hour later—and more than 60 times as likely as companies that waited 24 hours or longer.”4 Unsurprisingly, there are large benefits to striking while the iron is hot, and people are more likely to convert into patients if you catch them at their moment of highest intent, when they’ve become motivated enough to make an actual phone call. So How Can You Save Missed Calls? Some medical outfits have perfected the art of missing calls while keeping patients happy, but the key for most practices is instead to help patients get what they want even when you miss their calls. This is outcome #1 (the best one) on that list up above, and it’s a really powerful strategy. As we wrote in our recent ebook, patients are increasingly looking for on-demand, self-service ways to get answers and access care, and you can leverage this trend to convert missed calls into positive outcomes. Simple versions of this tactic have been around for years, with many clinics including their operating hours and other frequently requested information directly in their voicemail greetings. This allows some patients to get what they need without ever talking to a live person, and it’s popular for a reason. Recently, new advances in phone technology have expanded such possibilities dramatically, and modern telephony platforms (like Spruce!) 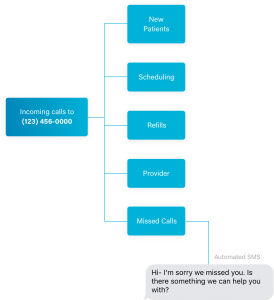 now have the power to help huge numbers of your patients, even when you miss their calls. “Call rescue” is a technology that gives callers options beyond just leaving a voicemail, and we’ve been really excited about it recently at Spruce. Diagram of a smart Spruce phone tree, showing a simple call-rescue text for all abandoned calls. Now, if you miss a call on Spruce, you can choose to have the system automatically send a text back to the caller and initiate any of a variety of advanced workflows. It’s as flexible as you want it to be, so this follow-up could be as simple as an open-ended text message, or it could be as complete as an invitation to a full after-hours telemedicine workflow, or anything else you can imagine. Call rescue lets you guide patients into self-service avenues to find information and get things done on their own, when you’re not available to talk with them live. If you’re interested in this feature, we’ll help you set it up, as there are a few important regulatory items to consider. Spruce also supports smart phone tree features, so you’ll be able to know where people were in your phone menu when they abandoned their call. If they wanted to request an appointment, for example, then the system could automatically send back an intelligent message about appointment times or other information relevant to getting into your clinic. On the inside, Spruce can then notify specific members of your team about certain types of missed calls, so that the right people can easily see who was trying to get a hold of them. 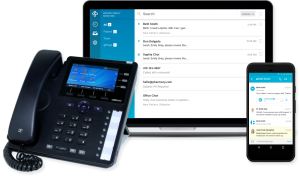 Spruce integrates across your desk and mobile phones and is also available on the web, so your team will never truly miss a call again. Call rescue changes missed calls from dead ends into active text-based conversations. This promotes patient engagement and satisfaction while making common workflows, such as intake form completion or insurance card collection, more efficient for everybody involved. Patients now expect more than voicemail and busy signals, and with powerful features like call rescue and smart phone trees available on modern medical communication platforms like Spruce, the days of the truly missed call are numbered. Learn more and get ahead of these changes in communication with our new ebook, “How Modern Communication Expectations Affect Medical Practices,” which you can download right here for free!